A new chapter in the adventures began with the promise of new work from Lady Eladryn d’Cannith, and an introduction to a mage to bolster the party’s ranks in the aftermath of Koff’s death. An evoker by trade, the new mage seems a cultured and witty contrast to the brute bluff charm of the fallen barbarian. About a week and a half of downtime on their return to Sharn allowed the group to dispose of various loot items, replenish stocks and purchase a few additional items that they hoped would be of use in their explorations. When the summons did come, it was delivered by a courier gargoyle, which made more than one person flinch in memory of the gargoyle that stalked them through the Sharn sewers in their first adventure. A handwritten letter invited them to the Lady’s town house, only for them to arrive in the middle of an assault by Karrnathi skeletons and zombies. Seeing their patron fall beneath the blades of her assailants, the party leapt into action and swiftly destroyed their enemies – saving her life. The intention of sending the adventurers in search of the fourth schema to match the two already retrieved and the one held by the Order of the Emerald Claw had to be modified by the discovery that the Emerald Claw’s assault had succeeded in stealing away the schema and pattern that Lady Eladryn had been holding on to. Now their mission was even more important – beat the Emerald Claw forces to the hiding place of the fourth schema and if possible retrieve the other pieces. To that end, a prototype elemental vessel was chartered to get the party to the mysterious continent of Xen’Drik. 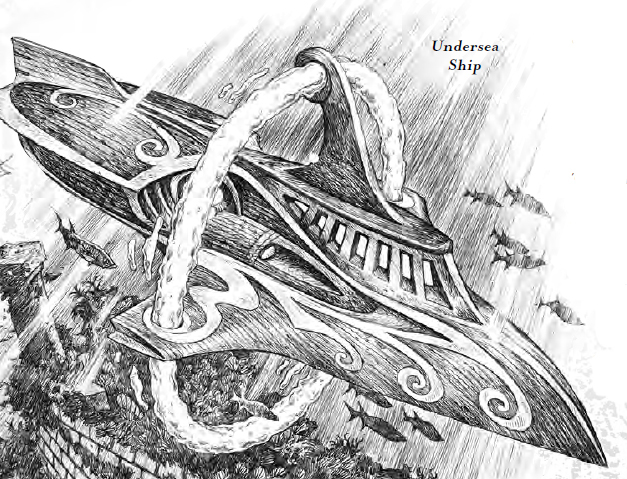 This craft, a sealed ship powered by bound water and air elementals, would travel beneath the waves to hopefully beat the Emerald Claw force to Stormreach and the journey into the jungles to come. Lady Eladryn reproduced as much of the documentation stolen by the Emerald Claw as she could to pinpoint the location of the missing schema in ancient Giant ruins. The ship and its gnomish crew took the adventurers from a hidden dock under the waves through the Teeth of Shargon, a wild archipelago mostly avoided by surface ships. All seemed to be going well until the craft was rammed by a Dire Shark. As welds began to pop, the captain directed the ship back to the surface, only for a huge net strung between rock columns to snare it. With the shark still somewhere nearby, the order was given to take water breathing potions, get outside, and cut the ship free.